Artists of Birmingham Royal Ballet in Faster. It is a slightly depressing sign of the times that Birmingham Royal Ballet feel they can afford to programme only two triple bills this season and are not touring them extensively. Triple bills are perceived as less successful at the box office and even Sadler’s, which usually has a loyal audience, was not full. The programme included works both old and new but it was not an altogether successful mixture. The dancers looked most at home, and at their most sleek and impressive, in Faster, a work made on them this year by their Artistic Director, David Bintley, evoking the striving of competitors in the Olympics. Given the slots for short works are so few, the choice to revive The Grand Tour seems something of a puzzle. It was made in 1971 by Joe Layton, whose background was in musicals rather than ballet. It uses the music of Noel Coward and portrays a series of celebrities from the 1930s on the deck of an art deco ocean liner. So we have Noel himself, Gertrude Lawrence, Mary Pickford, Douglas Fairbanks and others all doing their turns, admired by an elderly American lady. 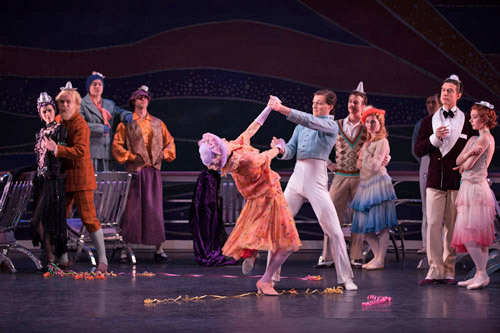 This piece hasn’t been revived for quite some time and is remembered as a vehicle for some very funny performances by characterful dancers of the past. In theory this ought to have played to BRB’s strengths: their sense of ensemble , ability to portray character and to have a good time on stage. But in practice it falls rather flat. Maybe its time has gone: do the audience today really recognise Theda Bara or Gertrude Stein or have the context of who is being spoofed here? The work itself feels slight. There must be better candidates in the back catalogue for revival. Few of the BRB dancers appeared to have the force of personality to really make an impression. Iain Mackay as Douglas Fairbanks did have the right swaggering attitude, and Elisha Willis as Gertrude Lawrence wafted her cigarette holder elegantly, but the men playing Gertrude Stein and Alice B. Toklas failed to seize any potential for laughs in playing these substantial ladies. Matthew Bourne’s dancers might have had a lot more fun and made more impact. Faster was originally named Faster Higher Stronger until the Olympic authority killjoys had a hissy fit about the use of their motto. They were wrong – they should have seized on this example of sleek and elegant athleticism as a celebration of aspiration towards the ideal. It’s a satisfying collaboration where all the elements support each other well. Music is by Matthew Hinson and designs by Becs Andrews, simple but evocative, moving from black and white in the opening sections to multicoloured running outfits for the massed ranks of the final section. Lighting is from Peter Mumford who conjures lanes and tracks from bars of light. Laetitia Lo Sardo with Artists of Birmingham Royal Ballet in Faster. This isn’t a literal depiction of athletes competing, though there are clearly references to swimmers, runners, and fencers. It’s a more idealised scheme about working and practising, as a team and alone. It takes a surprising turn when, after whipping up to a climax, the work suddenly subsides into a more contemplative and introverted pas de deux, where one dancer comforts or supports another. After all the striving, the certainty, a note of doubt creeps in. Is this all worth it? It is this reflective passage that sets this work apart from so many other gung-ho, relentlessly upbeat works tagged with the Olympic theme. The final section is based around a running theme, and Bintley manages a surprising amount of variety and texture from simple basic ingredients. There is a cast of 21, all working hard at what is very much a group exercise. Though it is difficult to pick out individuals, Tzu Chao Chu did catch the eye and Iain MacKay was the lone figure poised for action as the curtain fell. It was hugely popular with the audience who had been only tepidly polite for the first work on the programme. The programme concludes with Ashton’s The Dream, his distillation of Shakespeare’s A Midsummer Night’s Dream into a brisk narrative of just under an hour, complete with a quartet of quarrelsome mortal lovers at odds with each other, a bunch of interfering rustics, the warring fairy king and queen, Titania and Oberon, and Puck , the agent of much of the mischief and confusion by way of an enchanted flower. Despite this complex cast list the narrative is completely clear in its exposition and The Dream can be a real treat. This particular performance did not have the impact that it could have done: some things just did not quite gel. Casting plays a part. Cesar Morales makes a haughty and commanding Oberon and he has a fine way with a cloak (a very beautiful cloak, too, in Peter Farmer’s designs, different from those used by the Royal). But is seems odd to give him a Puck (the energetic Mathias Dingman) who is almost the same height as he is: the dynamic between them is out of joint as a result. Momoko Hirata is fairly new to the role of Titania: she looks exquisite but there was not as much chemistry between her and Oberon as one might expect, though this has the potential to develop further. Artists of Birmingham Royal Ballet in The Dream. The quartet of human lovers are generously cast including a couple of principals. However our Hermia ought to be noticeably shorter than our Helena: that isn’t quite the case here. The rustics seem rather more boorish than one might like, and in general the playing was broad rather than subtle. Jonathan Caguioa as Bottom has very neat feet in his pointe shoes when transformed into a donkey. BRB have kept many Ashton works in their repertoire (notably their adorable production of The Two Pigeons). However this performance did not seem to have quite enough of the lyricism of Ashton’s style consistently embedded in the dancers’ bodies. 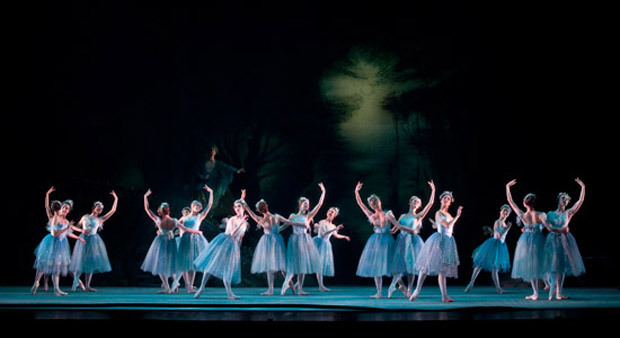 The arms of the fairies who enter in the first scene need to ripple beautifully as they bend at the waist: the flow and the suppleness was missing from the upper body movement and stiffness was encroaching. There are more casts to come for this programme which may change the dynamics of the performance considerably. It is well worth seeing for Faster alone. The Royal Ballet Sinfonia was conducted by Philip Ellis, cheerfully making the leap from Hindson’s new composition to Mendelssohn. The girls of the Birmingham Cathedral choir sounded bright and fresh in The Dream.